Colorful processions and cultural events marked Swamy Vivekananda’s 150th anniversary celebrations held at the Junior College campus, Kalleda. The college principal and village sarpancy flagged off the Rath Yatra from Kalleda to Pravathagiri, accompanied by students and teachers. Monks, Swamy Archananda and Sir Atma Chaitanya of Ramakrisha Mutt gave an inspirational speech and explained the teaching of Swamy Vivekanada on education and leading a fulfilling life. Along with the monks, nearly 30 volunteers were facilitated in the college hostel. 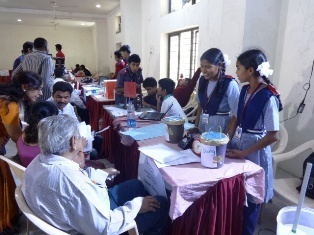 M. Rekha, Class 9 & M. Srivanya, Class 8, along with teacher mentor; Balnarsu of Matendla School participated in a State level science fair organized by KVR Scientific Society. After clearing the preliminary screening test, they presented their model ‘Green Energy’ to the selection panel. The model showed producing electricity using bio waste. Using cow dung, copper and zinc plates; they connected the plates, immersed in boxes of dung and made a watch work with the energy produced. While the students didn’t receive a medal, the participation boosted their confidence and has enhanced their interest in science and innovation. Here’s a fun way of combining Math and Social Science in a mind game that makes both subjects come alive! 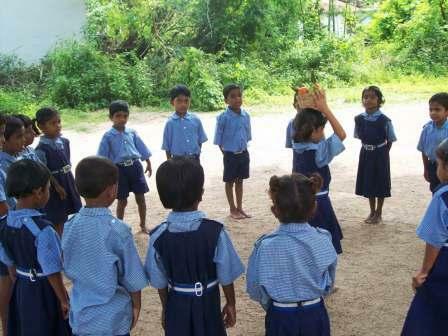 Students of Class 1 in Redlawada School played an inventive game of naming the vegetable, its colour and the cost per kilo. The vegetables were brought in a box, with the teacher asking them to name them, their colour and telling them about its cost. Then the game started with students asking each other to identify one vegetable, its colour and price correctly. Wrong answer, you’re out; correct answer, you continue! Of course there was a winner, the last child standing, but all in all, it was a wonderful activity and time well spent for everyone! The introduction of Butterfly Fields in Rollakal School has made a lot of difference in students’ learning process. 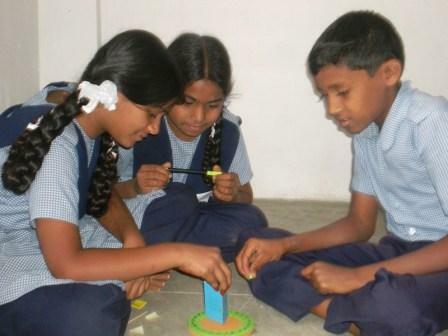 An activity based method to teach Science and Math, the teachers report that they are able to teach concepts betters and students are developing their analytical ability. Students study practical applications in these subjects and experimentation fires up their imagination. Enhancement of practical understanding also means that students are able to devise their own experiments. A noteworthy outcome has been Science models being displayed during District level Science Fairs and earning praise for their ingenuity! 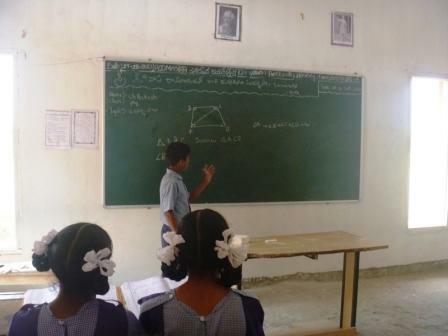 Maths was the theme for the day in Kalleda on the occasion of Srinivasa Ramanujan’s birthday on 22nd December. Several interesting activities were undertaking to increase appreciation of Maths and its usefulness in our lives. Students participated in games and activities such as Sudoku, seminars, quizzes and discussions on Ramanujan’s life and how he continues to be a role model. With a whole day dedicated to a subject equally revered and feared, the school hopes they have been able to help their students appreciate the subject and show them how it increases logical and analytical skills which are critical in daily life.